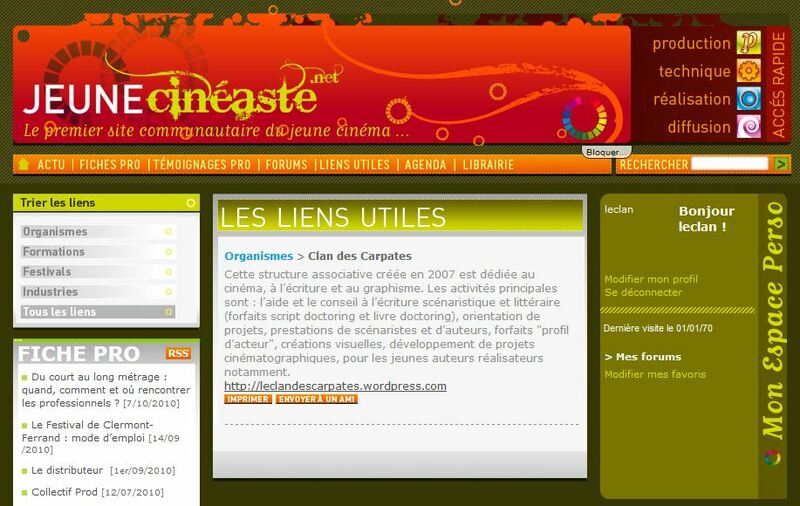 Founded in 2007 by writers/ directors Arnaud and Bertille Delporte-Fontaine, LE CLAN DES CARPATES, is a french associative organization specialized in three creative departments: movie making, writing, designing. LE CLAN helps authors, writers, directors, graphists, actors, producers, etc. to develop their projects. With offers such as “script doctoring”, “book doctoring”, we guide step by step each author in the making of his creation. LE CLAN is also, and first of all, a family of creators and authors, who write ceaselessly movie scripts, novels and comics; who direct relentlessly movies, and craft continuously new designs. In a world tainted by cynism, we incite you to follow your instincts and achieve your dreams. It’s in this current climate, that we at LE CLAN DES CARPATES present our offers, moral support, tutoring, expertise and skills to each creator, artist, or producer. Actors of all backgrounds, we are waiting for you to build together your future.